This yet another waterfall, very close to the top "edge" of the ridge. The waterfall had over the years had curved out an enclosed void within the ridge wall. 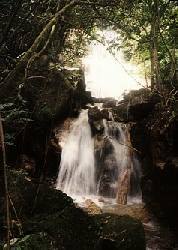 The waterfall is eluded from sight at the top of the ridge, or passers by trekking in the forest. Inside this hollow space the forest floor about 30 meters in diameters is devoid of undergrowth. Canopies of timber trees shielded the entire area of sunshine. 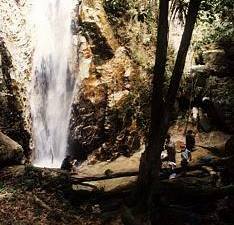 The bright patch in this photographs brought about by the presence of the main waterfall was the only location where the sun is shinning through. 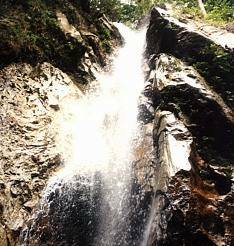 This is a beautiful but small waterfall of 4 meters high. The Quartz Ridge, a narrow upright hill has very steep walls. At this almost near the very top, inclination is extreme. The river flowing down get interrupted by narrow ledges. Each drop is executed as a beautiful waterfall. Water from river is uniquely directed downwards by the shape of the passage as a single sprout. The drop here is over 30 meters high. Thanks to the near by steep slope and the easy access to higher ground opposite the waterfall, I managed to record a more representative picture of a waterfall. Like all pictures of waterfall, its real impact will appears well in an aerial photograph. There is a tiny pool of 3 meters at its base . After that the river swiftly sneak into cracks among the boulders. Our challenge then was -who could get nearest to impact point? Just after having showered themselves at another waterfall, the group just could not resist tasting this one. Then, see how long can one endure the messaging action of the cold water? Looking upwards, [the camera cannot goes directly under the showers], it is indeed one long fall from above. The slope above or below, coming into the area of the waterfall and leaving all have gradients exceeding 45*. For those not conversant with outdoor life, crawling up the clayey slopes or descending will be done in distress. On dry days -that is!